Do you love racing and want to do more than just be a spectator? Have you ever watched the corner workers and emergency crews at a race and wondered how they got involved? Well, this is the place to get started. 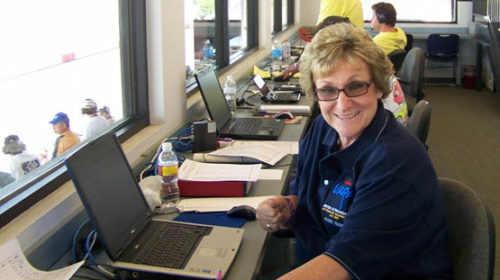 Cal Club’s race officials and specialty workers are an all volunteer work force that operate behind the scenes and on the front lines at all our races. In addition to Cal Club races, our workers staff pro racing events such as the Long Beach Grand Prix and the Grand Am and AMA races at the California Speedway. Our corner workers and emergency crews are recognized as some of the best trained workers in the country. It takes a small army of volunteers to put on a race weekend, and the specialties range from behind the scenes work at Registration or Timing and Scoring, to the most visible specialties like the corner workers and emergency crews on the tow trucks. Want to get started but aren’t sure where you will fit in? Read about each specialty below, and feel free to contact the Specialty Chief for any area that interests you. Worried about not having enough experience to participate? No experience is necessary to get started. This is all on-the-job training! We’ll have you working corners your first day, if that’s where your interest leads you. Imagine having the best seat in the house, mere feet away from some of the fastest race cars in the world. Rubbing elbows with racing celebrities and having the opportunity to meet your favorite race drivers. And at the end of each action packed day is an after hours social with drinks and snacks, where you can relax and swap stories with race drivers and your fellow workers. Stop Imagining and start doing! Getting involved as a worker or official is as easy as going to a local event and volunteering to help. Workers are issued a license just like the competition drivers, and can work their way up through the four levels of licenses by participating at different events and gaining the knowledge and experience necessary to hold a national specialty license. 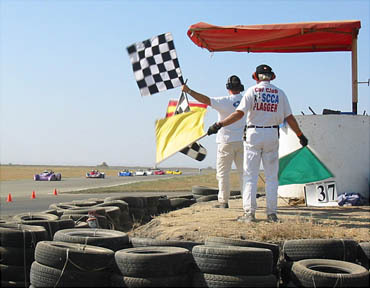 SCCA licensed workers help staff most of the motorsport events held in the United States in one capacity or another. For more information on licensing, read “Guide to Obtain an SCCA Official’s License“. SCCA members who volunteer for F&C have the second best seat at the event. They are the communicators. They signal the driver of many different situations and conditions through the use of flags. They are the eyes and ears of Control and the Operating Stewards. The accurate, concise and precise information they relay is the substance of good decision making by Stewards. They let other stations know conditions and needed warnings for drivers. Flagging and Communications personnel, at many events, are usually the first safety responders to incidents. Their primary fire fighting skills are honed at fire and rescue schools held by all SCCA Regions. They convey, often by unique hand signals, what is needed at an incident. They recognize their prime responsibility is for the safety of all concerned. F&C people are the witnesses to the facts and as such write the Witness Statements needed for consideration by the Stewards. They must convey accurate information from their perspective knowing that their writings may have significant ramifications for competitors. 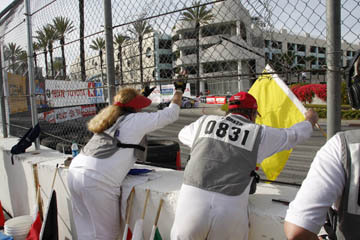 During off sessions they are SCCA’s fence line ambassadors who invite spectators to join. They will share information to help the spectator better appreciate the sport and more so the flagging and communications aspect. People of all walks of life come together in Flagging and Communications with a special camaraderie and sense of usefulness to the sport. The Flagging and Communications members are team players with many other specialties that are all needed to make SCCA events happen. When asked why they are involved in this specialty the immediate response is – “the people”. They weather the elements for the love of the sport and ensure the safety of the competitors and other volunteers. Attention all Doctors, Nurses, Firefighters, EMT’s, and Paramedics. Looking to get involved in the action? Medical Safety or Emergency Services could be for you. Medical Safety is a specialty for medical professionals. There is always an ambulance at the events. But in case of disaster, extra medical personnel are always helpful. The Medical Safety personnel see everything from minor cuts that just need Band-Aids to Medical Emergencies. Medical Safety people can also do more then one job at a time. They can be Racecar drivers, F&C workers, Paddock Marshals and even crew members. Emergency Services (ES) does many jobs at once. Their main job is to retrieve broken racecars off the track in a safe manner. Sometimes the cars only need to be flat towed and other times they need to be lifted off of tire walls or maybe even turned right side up. ES is also trained to use the “Jaws of Life” and other driver extracting equipment. This is why Firefighters fit into this job perfectly, since they already know the ropes of extracting people from wrecked cars. Pit – At times, drivers see pit lane as merely an exit ramp from the track to the paddock. Other times they will stop in the pits for many reasons. They may be tweaking the car during practice. Sometimes they need the help from their crew, for tire changes, pulling off flapping bodywork, or, on occasion, removing that stubborn pylon that got wedged up under the car. Sometimes it’s more serious. Drivers with a fire will head for the nearest fire extinguisher, which pit has an abundance. Pit workers monitor and assist every car that comes into pits, as well as working the entrance and exit of pits, signaling the drivers so they can blend in to race traffic without incident. Grid – In order to set a wheel (or four) on the track, racecars go though the grid. During practice and qualifying sessions, each car shows up during its assigned race group. Grid workers check for everything from safety equipment to problems with the car. The grid workers pass along any track conditions that might affect a driver, i.e. oil on the course. Before the races, cars are gridded in their spot according to their qualifying position provided by Timing & Scoring. From the grid the cars are sent out to an official on the track who will split the group into its two-by-two order and send them off to the starter. Grid workers get to mingle with the drivers and crew. People who are very observant and aware of their surroundings make great Pit and Grid workers. It is early morning and you can hear the birds beginning to stir. There is a faint glow in the east showing a clear sky (meaning, thank goodness it isn’t raining). You are heading toward the Registration building excited about meeting the first person in line for the day. Maybe you will be doing Drivers and Crew or maybe worker/official registration. Oh yes, don’t forget to turn on the laminating machine for making photo-ID’s. How many other Registration workers will be there? Last race we were well staffed but everyone still had plenty to do. It is nice though, once in a while, to get a break in the waiting line so you can get a refill of coffee or a soft drink from the cooler. 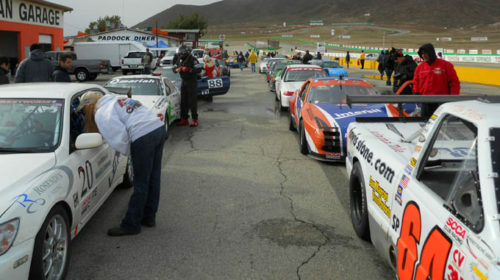 Registration is the first Specialty which an SCCA participant encounters on a Race Weekend. Prior to the weekend, we process the competitors’ entries in preparation for the Driver’s and Crew’s arrival, assign car numbers and race groups and collect entry fees. Also, each person entering the race track must sign the insurance waiver of liability and show his/her current membership card and license. 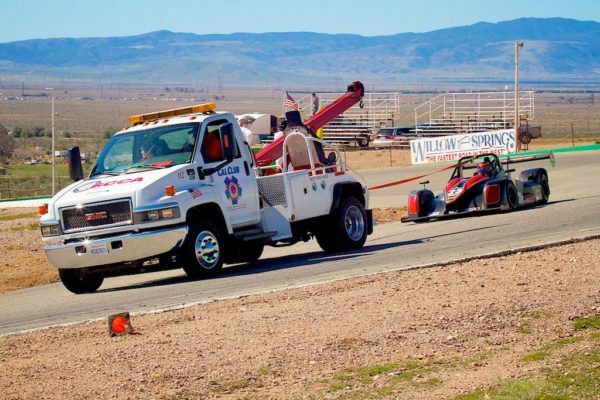 In this way SCCA ensures that we consistently review the status of everyone exposed to the risks of our sport. In addition, we account for the number of workers/officials at each event and keep track of any monies collected at the track. Individual entry information is passed on to Timing & Scoring, Medical personnel and the Stewards as well as to Grid and Paddock. While Registrars are usually most busy in the morning when they first open, they do not stay open all day long, so there is some time during the day to do other things, watch racing, help other Specialties or just relax. Want to get close to the action, but don’t want to be in the action? Sound Control could be for you. Those who staff sound control get to be out near the track and the action, but since their duty is to read the sound meter, they don’t go out on the track like the F&C workers do. 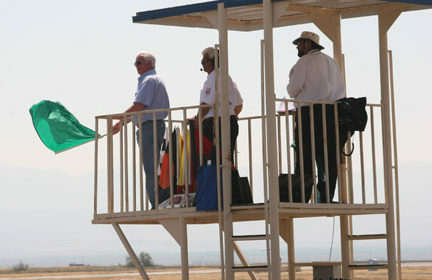 SCCA Sound Control Officials monitor the sound level of passing race vehicles during all practice, qualifying and race sessions. These readings are logged by car number and class every lap when the car is clear of traffic that could interfere with the reading. Weather readings, Temperature, Humidity, Wind Speed and Direction, Barometric Pressure and Weather condition are also recorded regularly. Regular sound level meter calibrations are checked and recorded. Cars that exceed the maximum allowable level are reported to the operating Steward so that appropriate action can be taken to correct the problem and allow the car to return to the track. Cars that are close to the maximum level are advised so they may be adjusted, so that weather condition changes do not cause the sound level to exceed the maximum allowed level. These report forms are posted to allow the competitors to see their readings and allow for changes to the car. The reports are also submitted to the Stewards and forwarded to the SCCA National office for checking and record keeping. Do you like to tell others what to do? Do you like lots of attention and even TV time? Can you keep track of several things at once? Start might be the specialty for you. Start is a combination of some of the skills of Flagging and Communications (F&C), some of the skills of Timing and Scoring (T&S), a few new skills plus fast decision-making and its all done with everyone’s attention on you! It’s fast-paced, never boring and yet very important. We use all the flags that F&C does. Add in keeping track of the leaders and number of laps completed plus they have a few flags all our own. It’s a lot of fun and the best seat in the house to see the start or finish of the race. The drivers might disagree a bit on that, but they really can’t see as well as the Starters can. Everything in the F&C description is also true of Start. They use their flags and a few signs as well to signal information to the drivers during the race. At some tracks Starters even respond to incidents. In their traditional Black-and-White, Starters are visible even during their off periods and become ambassadors for SCCA in the paddock and sometimes even in the spectator areas. The camaraderie among starters is very special, forming a nation-wide “family” of starters. If this sounds like something you would enjoy, come on out and join the fun! Don’t feel up to braving the weather? Too hot, cold or wet outside for you? Most timing and scoring buildings are heated/ air conditioned, to keep staff, papers, computers happy and out of the weather. Working in T&S can be a very rewarding job. You have first-hand knowledge of the running order, and are responsible for producing the official results. There is a special friendship among those in Timing and Scoring as they all work toward that common goal – to make a race a race. Funk & Wagnall’s Standard Dictionary defines a race as: a contest to determine the relative speed of the contestants. “Timing and Scoring’s function is to report the race by recording each competitor’s speed, scoring him/her according to the number of laps completed, the order in which he/she crosses the start/finish line, and by producing accurate results of this contest. This is accomplished by the five groups, which make up Timing and Scoring – Manual Timing, Electronic Timing, Scoring, Communications, and Results. Manual Timing refers to the use of stopwatches to measure each competitor’s lap times. Each timer is assigned one or more cars, and records cumulative and lap times for each car on time cards. Scoring records the position of each car in the field by writing the car numbers on a lap chart in the order they cross the start/finish line. The lap chart is a visual record of the number of laps completed by each competitor and his/her position within the running order at any time in the race. 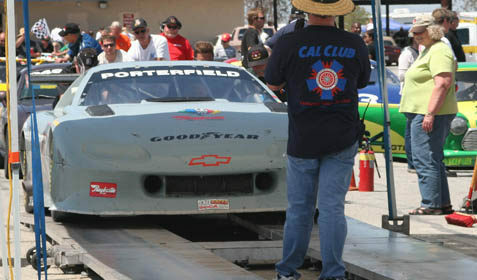 Electronic Timing combines the lap times and field position. As each car crosses the start/finish line, tapers manually record its number, and a timing device electronically records the time. The car numbers and their times are then entered into a computer, which calculates lap speeds, the running order, and the number of laps completed. Flagging & Communications keeps the timers and scorers informed of the status of cars that are missing, and whether or not they will be returning to the track. All this information is then passed to the Results team, which verifies the data and compiles the official qualifying and race results. These results are then distributed to the race officials, competitors and the press. This is the specialty to work in if you want to get up-close views and personal knowledge of some great racecars. You not only get to see great racecars, but you get to meet some great drivers and crew. Approve cars that comply with all safety regulations. Conduct inspections of cars at the request of the Chief Steward. As a Scrutineer it is your responsibility to help the Chief Technical and Safety Inspector (Chief of Tech) to perform the duties required of him. These include jobs such as weighing cars, checking ride height, verifying engine seals, issuing logbooks / annual inspections, writing up accident investigations, and doing displacement and compression ratio calculations, etc. The job of a Scrutineer is an important one that can sometimes be demanding. Our purpose is to verify that the rules are being adhered to.